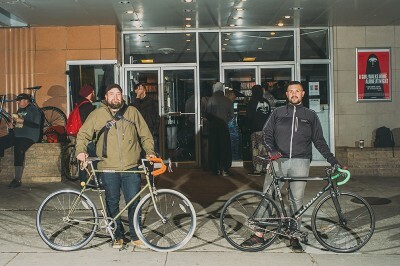 (L–R) 999 Ride organizers Phill Faber and Nicholas Lotze hang out in front of the Tower Theatre before heading out. The 999 Ride was originally called An Evening in the City with Naresh. It was named after founder Naresh Kumar, who was inspired by an Outdoor Retailers ride that he had participated in. Kumar, along with his friend Skylar Hoellein, began the weekly Thursday ride by promoting with a Facebook event. Initially, the rides were started from Liberty Park, but the starting location was moved to the 900 East and 900 South area, and the name was officially changed to the 999 Ride. Soon, the ride gained popularity, partly due to its all-inclusive message that anybody could join in, no matter the bike or pace ridden. The rides started out with Kumar leading the column of cyclists, but it quickly became a sort of free-for-all, as anyone could take center point. This egalitarian approach seems to work for this group, considering that the rides are very much an on-the-fly kind of deal with no preset course. There is, however, one exception to this leaderless rule: The column does not travel east due to the steep hills. The 999 Ride is usually spread via word of mouth and promoted through Facebook. So far, that seems to have worked out rather well for gaining attendance. 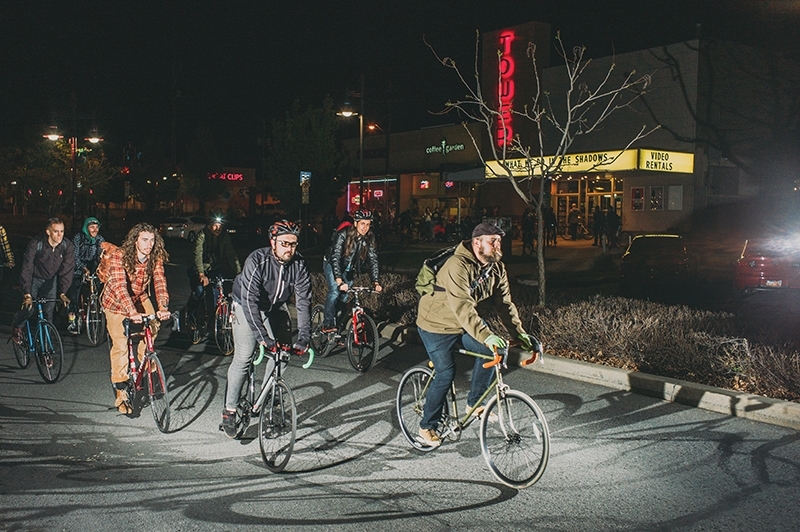 It also helps that, when there is a large group of cyclists milling about on a Thursday night in front of Coffee Garden or Tower Theater, one tends to get somewhat curious as to what’s going on. Recently, Faber and Lotze have been trying out a new way to attract interest. To boost participation and awareness of the 999 Ride, they hand out business cards to fellow cyclists they encounter. When scanned, they bring those curious or interested to the Facebook page. 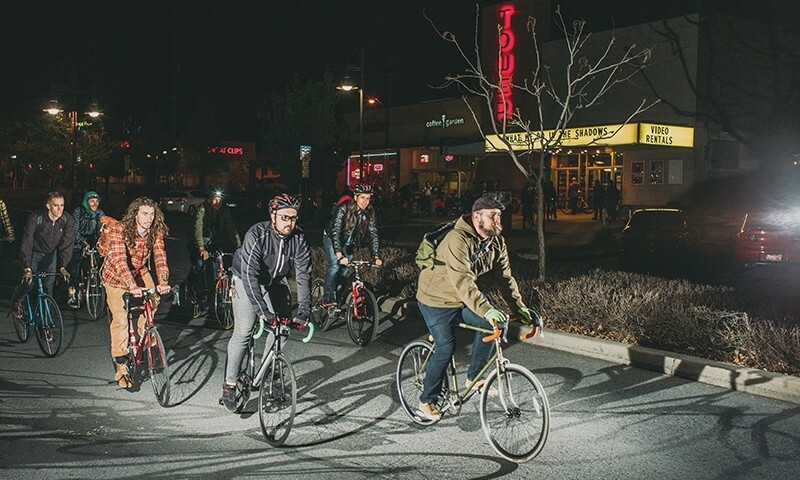 There have been other rides inspired by the 999 Ride—one specific case was the creation of a more family-friendly ride called SLC Bike Party. This new ride was not viewed as a competition. Rather, it was welcomed by the 999 Ride organizers. 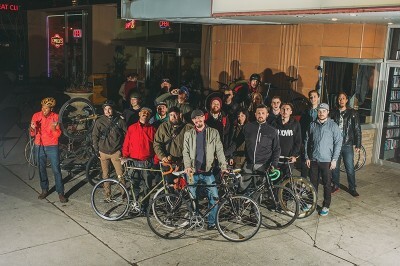 In reference to the new ride, Faber says, “Yeah, I’ll promote your ride, and I’ll tell that to anybody else who’s got an idea for a ride.” However, due to what was described as low attendance and the SLC Bike Party’s main organizer’s schedule conflicting with the event, the ride eventually petered out. The organizers behind the 999 Ride are involved in other bike-related projects, too. Drop-in rides will be organized as well as a mountain bike ride that will be on Saturday mornings starting at 9 a.m. The latter event will also be meeting at Coffee Garden on 900 East and 878 South. Admins of the Facebook page also take care to promote other bike community events, like Bike Prom. So, dig this and stay informed about future rides by checking out facebook.com/999ride for more details.